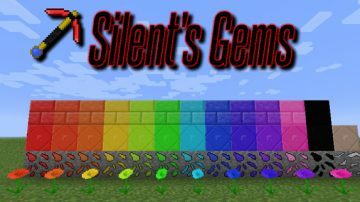 Silent’s Gems Mod is a new mod that was created in order to deliver new flavor and interesting options to the world of Minecraft. 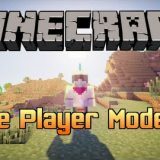 What this Silent’s Gems Mod Minecraft does is that it provides you with the tool and opportunities that you need in order to enhance your gameplay experience. Basically, you get some new stuff like 12 new gemstones. These might not seem like much at first but you can use these in order to create a variety of new tools and gadgets. As you can expect you can get quite a lot of value from them since they enable faster and better crafting, more options and cool gaming moments. It’s important to note that the mod does require the installation of Java 8 as well as Silent Lib if you want to run it properly which can be very important to begin with. Right from the start you will find these new gemstones to offer a variety of new options as you play. Aside from being colorful they also come in handy and offer a very good user experience right from the start. Creating new tools and gadgets is a lot of fun but it’s also very helpful as you play which is always important! Aside from the gems you can also find some cool stuff as well. This includes the Return Home Charm that can be very helpful since it enables you to return to a previous location without any problem. This Silent’s Gems Mod Minecraft can also provide you with a Torch Holder where you can actually keep around 1000 torches. These things might seem like not being that important at first but they do provide you with the value and results that you would expect from such a title. The Silent’s Gems Mod also enables you to summon a tamed cat or dog and they will actually come with you as well. The name of the mod doesn’t really showcase that but you do get these and many other items in this mod which does make it quite fun and refreshing to begin with. 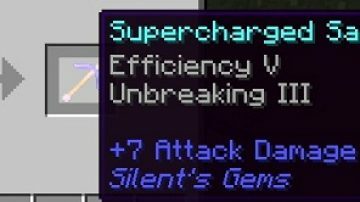 Integrated in the Silent’s Gems Mod you will be able to find some enchantments as well. Some will repair the damaged tools, others will help you heal while others will help cut down a tree or mine faster. 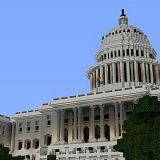 The randomness of these effects is what makes the Silent’s Gems Mod Minecraft great and you are bound to like the great attention to detail and results that come here. If you feel that the game doesn’t have enough variety and you need more, this can definitely come in handy for you. Give the Silent’s Gems Mod a shot and you will not be disappointed! Tools: Choose from over two dozen types of swords, pickaxes, shovels, axes, hoes, sickles, and bows! Armor (version 1.3.00+): It’s armor. Made of colorful gems. What more do you want? 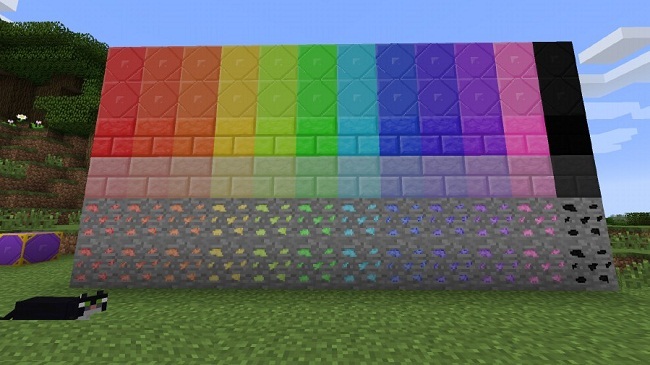 Blocks: Bricks, lamps, teleporters, and more! Enchantment Tokens: Invest your resources to enchant tools, instead of XP! They should work with most other mods. Chaos Gems: Somewhat like reusable potions, but you can also use them to fly! Return Home Charm: Return to a set point from anywhere, even across dimensions! 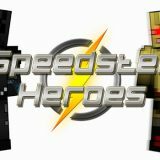 Tools and armor can be made of the twelve gems you can find in the world, plus the “supercharged” gems that you can craft, flint, and maybe some other things, giving a total of over 25 different materials. Each material creates items with different durability, mining speed, attack damage, and enchantability. After being crafted, tools (not armor) can be “decorated” by crafting them with additional gems. This changes their appearance only. Flint: Mining level of stone tools, but faster and more durable. Regular Gems: Mining level of iron tools, but faster and much more durable. Supercharged Gems: Mining level of one above diamond tools. Four times the durability or regular gems, much faster, and higher attack power. Crystallized Chaos Essence: Similar to supercharged gems, but even faster and more powerful with special abilities. Work in progress, but usable. Right-click to place things: If you have a block in the slot after a pickaxe, shovel, or axe, you can right-click with your tool to place it! This also works with the Torch Bandolier. If that slot is not placeable, it will check the last slot of your hotbar instead. You can disable this feature in the config. Decorating: Place a tool in a crafting grid. Then place gems (regular or supercharged) in slots adjacent to the tool. This will exchange part of the tool with that gem, changing its appearance. You can also place a block of wool in any slot to add a cosmetic grip on the tool rod. Decorating a tool with gems also repairs it, making it a good way to keep your best tools alive! Flint can also be used for decorating, but will only repair flint tools! Use glass to restore a part to its original state. Statistics: All tools will track various things as they are used, such as the number of blocks you’ve mined/placed with them, how many times you’ve struck monsters with them, etc. Hover over a tool andhold Ctrl to view a its statistics. Tool upgrades are additional things you can apply to tools that are not enchantments or cosmetic changes. Tipped Upgrades: These change the harvest (or mining) level of the tool and boosts its durability. 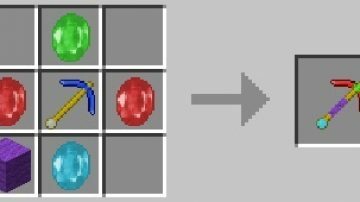 For example, apply an iron-tipped upgrade to a flint pickaxe to mine gems, diamonds, etc. Apply a diamond-tipped upgrade to mine chaos ore and obsidian. You can completely bypass vanilla tools! No Glint: Removes the “enchanted glow” from a tool. Apply again to reverse the change. 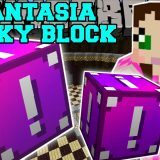 Tired of making mob grinders and hoping you’ll get the enchantments you want? Why not just invest your mineral assets into enchanting instead? With enchantment tokens, you can have exactly what you want, for the right price! They should also work with tools from most other mods (no, they don’t work with Tinker’s Construct!) Of course, you can still use enchantment tables if you like. How to use: Craft the enchantment tokens you want (you’ll get one level of the enchantment per token), then craft the tokens with a tool. You can craft multiple tokens with a tool at one time, just put one token in each slot. Normal enchanting rules apply. Keep in mind that enchantment tables won’t work on something that is already enchanted, but tokens will. Somewhat like reusable potions, but they can also be used to fly! You can have up to three effects on a single gem, by default. While active, they will drain their charge and apply the appropriate effects. If they run out of charge, they will be disabled, removing any effects immediately. How to use: Craft a Chaos Gem with Chaos Runes to give it effects, one rune per level. They can be activated by either right-clicking with them in your hand, or pressing a key (check your keybindings). Want to get around faster? Silent’s Gems has some modestly priced teleporters to use! There are three kinds: regular, redstone, and anchors. These teleporters are somewhat “dumb”. They don’t actually care if another teleporter exists at the destination, but you need two teleporters to set the destination. Recipes can be disabled in the config file. How to use: Place any combination of teleporters you wish (even anchors). Use a Teleporter Linker to connect pairs. You can link any of the three types together however you wish! Note that there are no actual “links” between the teleporters. The linker merely tells the teleporters where to send things. Try using anchors to establish one-way connections. It now costs XP to use teleporters by default! Short distances are free, longer distances require linearly increasing amounts of XP, and traveling between dimensions has a flat cost. Regular – Can teleport players that right-click on them. Redstone – In addition to the functions of the regular teleporters, these can be triggered by a redstone pulse. They can also teleport non-player entities! Teleporting non-player entities across dimensions is currently a bit broken. Anchors – Not capable of teleporting anything, but the other teleporter types can link to it. Also much cheaper! Chaos Altar: Stores chaos energy and charges items that can use it. Passive Chaos Pylon: Generates a small amount of chaos energy each tick, for free! Burner Chaos Pylon: Generates a modest amount of chaos energy each tick, burning furnace fuel to do so. The pylons must be placed near the altar to function correctly! They can be no more than 4 blocks away on the x- and z-axis, and no more than 1 block above or below the altar! This mod adds a couple of enchantments. You can get them through enchantment tokens, or the enchanting table! Mending – Randomly repairs the tool/armor a bit from time to time. Works with tools/armor from other mods! More effective at higher elevations. Area Miner – Lets tools mine a 3×3 area, but cuts their speed to 20%. Restricted to gem tools. Lumberjack – Lets an axe chop down an entire tree at once! It will work like a regular axe if it doesn’t detect a tree (wood with leaves on it). Speed reduced to 10% when felling a tree. Conflicts with Area Miner, restricted to gem tools. Life Steal – The user is healed for a small fraction of the damage they deal. Return Home Charm – Right-click on a teleporter (anchors are fine) to bind it to that point. To teleport, hold right-click for a certain amount of time (24 ticks by default), then release! Torch Bandolier – It stores 1024 torches. Right-click to place torches. Place in a crafting grid to extract a stack of torches. It absorbs torches from your inventory on its own. Summon Kitty/Summon Puppy – Spawns a tamed cat/dog. You can also name it in an anvil, just like spawn eggs. Fluffy Puffs – A cotton-like plant that you can get just like wheat seeds (breaking grass, normally). Plant them to grow more, then use them to craft wool, string, feathers, fluffy fabric, or fluffy blocks. Fluffy Blocks will reduce/negate fall damage when you land on them, depending on how many are stacked below the topmost.